Wreck-It-Ralph was originally released on blu-ray in March, 2013. Jeff and George reviewed it on Communicore Weekly (the Greatest Online Show™) during it’s initial blu-ray release. Enjoy this retro-review! George: Jeff and I made it pretty clear on Communicore Weekly that we both loved Wreck-It-Ralph. In our minds, it should’ve taken the Oscar (from 2012, folks), but we’re not here to talk about that. We both received our review copies of the Blu-ray of Wreck-It-Ralph and it’s pretty obvious that we both still love the film. Jeff: The film is absolutely amazing. It has a wonderful story, well developed characters, and the animation is fantastic. Also, for video game nerds, it is chock full of little references to all of your favorite, classic games, from Q-Bert to Sonic the Hedgehog to Street Fighter. Seriously, it was a total win all around in our book. George: With the strange randomness of llu-ray extras lately, I wasn’t sure what we would see (or wouldn’t see). When the disc showed up, my family watched the movie right away. Even though we saw it twice in the theater, we still watched it twice at home before venturing into the special segments. By far, the most exciting part was the special intermission that occurs when you pause the disc. Instead of getting a paused screen, Disney (and probably other releases) started adding bonus content that plays when the movie is paused. Ideally, this entertains the people on the couch when someone needs a bathroom break or has to refill the popcorn. We first saw this on the Muppets and it was just as exciting and entertaining as the film. Sadly, nobody wanted to leave the room when we paused the film. So, Jeff, tell us who’s on the intermission of Wreck-It-Ralph. 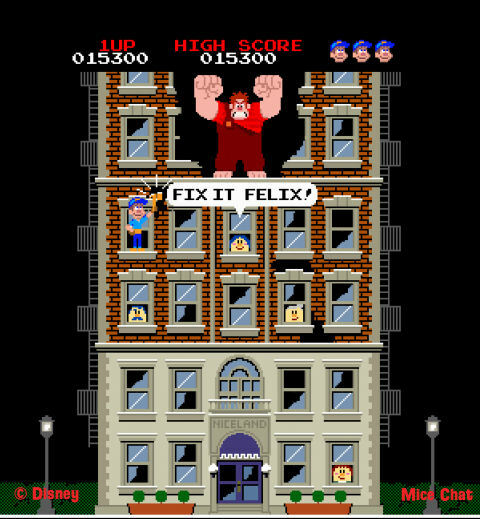 “Wreck-It Ralph” – Fix It Felix, Jr. visual development. ©2012 Disney. All Rights Reserved. Jeff: You guys, it’s Chris Hardwick, of Nerdist fame! I LOVE THAT GUY! Seriously! I’m going to see him do stand-up in April! Anyway, yes, Chris shows up as your intermission host, and helps point of some of the Five Legged Goats (or, if you know them by their non-Disney name, Easter Eggs) of the film. He only scratches the surface of all the hidden video game references, but it’s great to see Disney really catering to their audience here by getting a host who knows his stuff and is very funny in doing so. By far, that was my favorite of all the blu-ray extras. But that’s not to say the rest weren’t fantastic as well. George: Disney added a short to the theatrical release called Paperman and, in many ways, it’s the antithesis of Wreck-It-Ralph—sort of. It’s a black-and-white short that has as much heart as Wreck-It-Ralph and does it with being purposefully old school. It’s a beautiful mixture of line and computer animation. There are a slew of other bonus features that talk about how the digital worlds were created that offer a lot of insight into creating a video game world that looks decidedly 8-bit. Jeff: There are a few alternate / deleted scenes that don’t really add anything to the mix. But there are a handful of “commercials” for the games featured in the movie, just like you would see on TV back in the 80s/90s for your local arcade. Those are a neat touch. “WRECK-IT RALPH” (Pictured) RALPH (voice of John C. Reilly) amongst other video game bad guys. ©2012 Disney. All Rights Reserved. Jeff: On top of that, visually, it’s amazing, especially with this Blu-Ray transfer. This is seriously a must own for kids of all ages. We definitely recommend this film! Did you pick up Wreck-It-Ralph? Who is your favorite character?